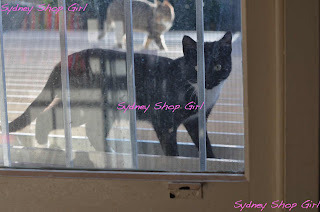 Sydney Shop Girl: Orange Remains in the Collective Consciousness. There's no denying it. The love of orange is here to stay. It has entered the collective consciousness of the retail sector in a big way. And I am powerless in its wake. Never one to do things by halves, this cup and saucer are on the large side in real life. Large as in at least a metric cup and a half. They are from T2, my new tea mecca. Say hello to my new tea cup and saucer set for work. My current mug is on its last legs. It's deeply stained (despite getting a home bleach bath once a week) and its cracked on the inside. I thought a cup and saucer combo would be a nice change from my usual mug. 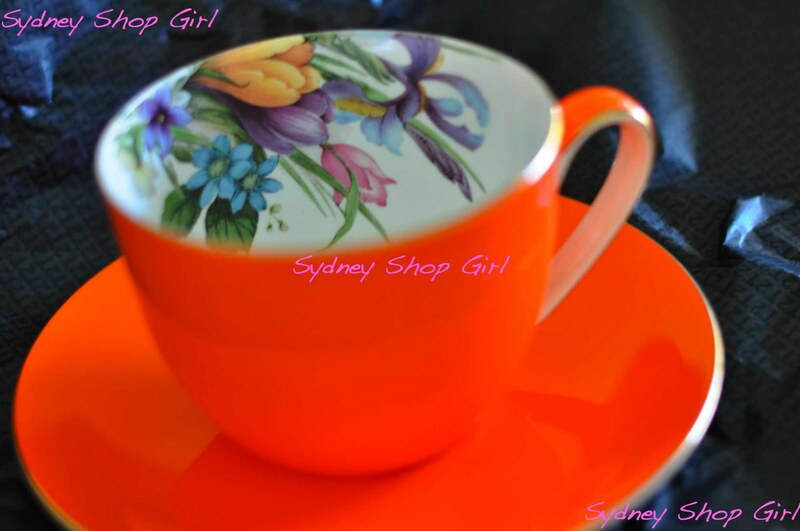 A cup and saucer lend some ceremony to morning or afternoon tea. Plus, the saucer is a handy spot for a couple of biscuits or a piece of chocolate. The times I've balanced my afternoon snack on whatever page I was reading at the time. The real reason I was at T2 was to address the work tea bag shortage. I've been really enjoying the T2 teas that I've tried so far and decided to splurge a bit for work. So instead of Tetleys for black tea, I've now got the Sydney and Brisbane Breakfast teas. I also got a large bag of Chamomile tea bags for my caffeine free needs. I was going to try Chamomile and Lavender but there was only a loose leaf tea version available today. I will report back after I've tried them all. Otherwise, I've been keeping well. The neighbourhood cats have been checking in on me to make sure. There's something about the roof of the garage they cannot resist. I think it's the noise they make as they scuttle across it. They're even louder than me in ugg boots across wooden floor boards. I suspect we're in competition over this. I gave one of Julie Goodwin's slow cooker recipes a go last night. 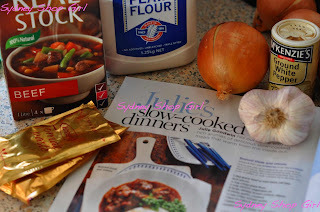 The Braised Beef and Onions from this month's issue. I could coat diced meat in seasoned flour using a large zip lock bag for the rest of my days. It's very satisfying and fool proof. Unless you score a dodgy zip lock, I guess. It was really easy and used readily available ingredients - beef stock, tomato paste, sugar, lots of onions (four), garlic, plain flour, seasoning and gravy beef. The only technical aspects were browning the beef and sauteeing the onions. Because it was the weekend, I went the extra mile on these points rather than just tipping everything as is into the bowl of my slow cooker. 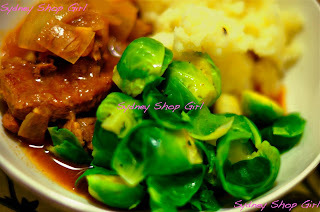 The beef was very tender and the flavours were simple but comforting. I'm going to use 500ml instead of a litre of stock next time as my gravy turned out rather thin. Oh, mashed potatoes and brussel sprouts, you are my favourite winter vegetables. You looked and tasted great with the beef. 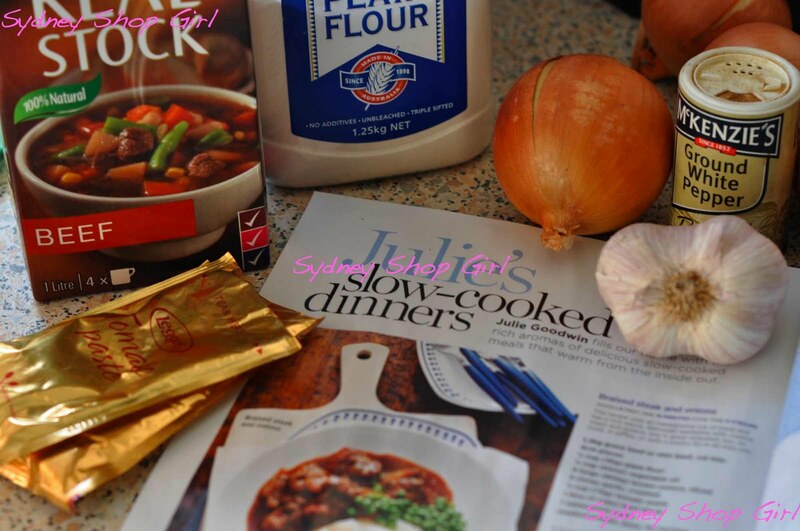 In the recipe notes, Julie suggests that the beef would make a great pie or jaffle filling. I had leftovers which I'm planning to use in these dishes. I've an early start tomorrow. I'm off to a breakfast meeting at Parliament House. The CBD for work related purposes! How novel. I've got my outfit sorted (grey suit) and a taxi booked. I invited Mr SSG to share my taxi instead of catching his usual bus. The selflessness and kind heartedness of some people is beyond words. And on that self indulgent note, have a lovely evening! Dinner's nearly done and I've got a scandalous chick lit novel to finish. 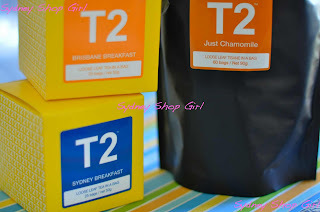 I'm a bit obsessed with T2 teas as well - love the shops and how passionate their SAs are! 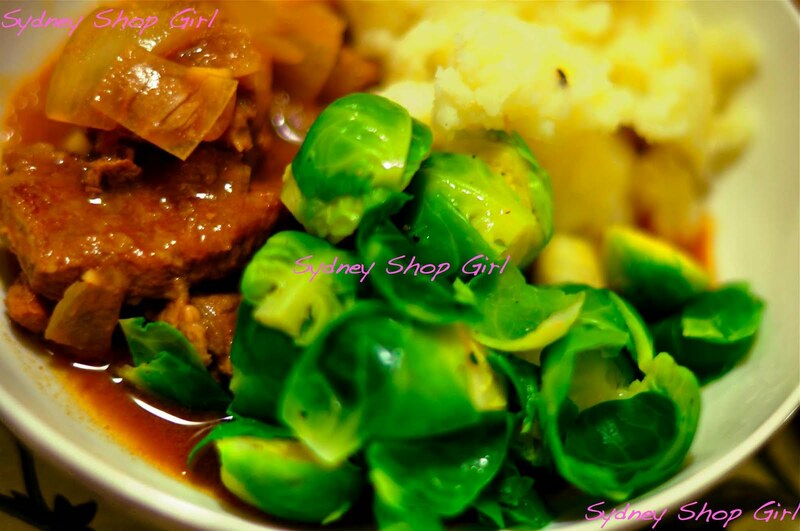 I love braised steak and onions. It is under rated as a dinner option. Heavenly Ingredients: I know, the T2 SAs are so nice. I love lemongrass and ginger too! I had mine this morning with a dash of honey. 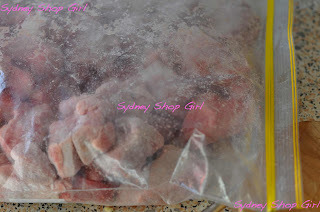 AFW: do let me know how the lamb shanks go. They look fab in the magazine. I like Brisbane Breakfast. I just can't be patriotic - Perth Breakfast is icky. Enjoy your meeting as best as possible - hope the tea is good! Oh I am so enamored by T2, we are including it in our bon bonnier ;) ;) ;) that and a few other things. I'm sipping out of my new T2 cup and saucer at the moment..... only 7 more hours of night shift to go! I have that tea cup but in red. Maybe it needs an orange mate? They could colour block together. Looks like all is in order, love the teacup! SSG please tell, what is the title of your scandalous novel? Hostess: the scandalous novel was Something Borrowed by Emily Giffin. Just reveiwed it on the blog today.